"Night Stalkers", "160th SOAR (A)", "Task Force Brown"
"Night Stalkers don't quit! ", "Death waits in the dark! ", "Six guns don't miss!" Its missions have included attack, assault, and reconnaissance, and are usually conducted at night, at high speeds, low altitudes, and on short notice. The 160th SOAR is headquartered at Fort Campbell, Kentucky. The 160th SOAR (A) consists of the Army's best-qualified aviators, crew chiefs, and support soldiers. Officers volunteer while enlisted soldiers volunteer or are assigned by the U.S. Army Human Resources Command. Until 2013, only men were allowed to be pilots in the 160th. Upon joining the 160th, all soldiers are assigned to "Green Platoon", in which they receive intensive training in "advanced methods of the five basic combat skills: first responder, land navigation, combatives, weapons and teamwork". The weapons training includes firing hundreds of rounds with the M9 pistol, M4 carbine, and AK-47 as well AK-74 rifle. Soldiers who fail to pass the course a first time may retake it, but there is no guarantee that anyone assigned to Green Platoon will pass and continue on with the 160th. The basic Night Stalker course for enlisted soldiers lasts five weeks; the officer course lasts 20 to 28 weeks. After the 1980 Operation Eagle Claw attempt to rescue American hostages held in Tehran, Iran, failed, President Jimmy Carter ordered former Chief of Naval Operations Adm. James L. Holloway III to figure out how the U.S. military could best mount another attempt. At the time there were no U.S. helicopter units trained in this kind of stealthy, short-notice Special Operations mission. The Army looked to the 101st Aviation Group, the air arm of the 101st Airborne Division (Air Assault), which had the most diverse operating experience of the service's helicopter units, and selected elements of the 158th Aviation Battalion, 101st Aviation Battalion, 229th Aviation Battalion, and the 159th Aviation Battalion. The chosen pilots immediately entered intensive training in night flying. This provisional unit was dubbed Task Force 158, since most of its pilots were Blackhawk aviators detached from the 158th. Their distinctive 101st "Screaming Eagle" patches remained on their uniforms. The Blackhawks and Chinooks continued to operate around Campbell Army Airfield at the north of post, and Saber Army Heliport at the south. The OH-6 Cayuses, aircraft that had vanished from the division's regular inventory after Vietnam, were hidden on base in an ammunition holding area still known as the "SHOC Pad", for "Special Helicopter Operations Company". As the first batch of pilots completed training in the fall of 1980, a second attempt to rescue the hostages was planned for early 1981. Dubbed Operation Honey Badger, it was called off when the hostages were released on the morning of President Ronald Reagan's inauguration. Task Force 158 was the Army's only special operations aviation unit, and its members had already become recognized as the Army's premier aviation night fighters. Their capability was judged too useful to lose, and so instead of returning to the 101st, the pilots and modified aircraft became a new unit. (Original members of the Night Stalkers refer to it as "the day the Eagles came off".) The unit was officially established on 16 October 1981, when it was designated as the 160th Aviation Battalion. The 160th first saw combat during 1983's Operation Urgent Fury, the U.S. invasion of Grenada. Super 6-4 one month before the Battle of Mogadishu. From left: Winn Mahuron, Tommy Field, Bill Cleveland, Ray Frank and Michael Durant. In 1986, it was renamed the 160th Aviation Group (Airborne); and in May 1990, the 160th Special Operations Aviation Regiment (Airborne). As demand for highly trained special operations aviation assets bloomed, the regiment activated three battalions, a separate detachment, and incorporated one Army National Guard unit, the 1st Battalion, 245th Aviation (OK ARNG). In 1987 and 1988, its pilots took part in Operation Earnest Will, the protection of re-flagged Kuwaiti tankers in the Persian Gulf during the Iran–Iraq War. They flew from US Navy warships and leased oil barges in a secret sub-part called Operation Prime Chance, and became the first helicopter pilots to use night vision goggles and forward looking infrared (FLIR) devices in night combat. In June 1988, the unit executed Operation Mount Hope III. Two MH-47 crews flew 490 miles (790 km) deep into Chad to retrieve a crashed Mi-24 Hind medium-attack helicopter. The Night Stalkers spearheaded Operation Just Cause, the 1989 invasion of Panama, and they were also used in Operation Desert Storm in 1991. In October 1993 in Somalia, Night Stalkers became involved in the Battle of Mogadishu, which later became the subject of the book Black Hawk Down, and its film adaptation. Two Night Stalker Black Hawks, Super 6-1 (piloted by Cliff Wolcott), and Super 6-4 (piloted by Mike Durant), were shot down in the battle. Five of the eighteen men killed (not counting a nineteenth post-operation casualty) in the Battle of Mogadishu were members of the Night Stalkers team, who were lost along with the two Black Hawks. During the 2001 invasion of Afghanistan, the Night Stalkers from 2nd Battalion supported two task forces established in early October 2001: Dagger and Sword. (Their unit in TF Sword was designated Task Force Brown.) In the evening of 18 October into 19 October 2001, two SOAR MH-47E helicopters, escorted by MH-60L DAPs (Direct Action Penetrators), airlifted U.S. troops from the Karshi-Khanabad Air Base in Uzbekistan more than 300 kilometers (190 mi) across the 16,000-foot (4,900 m) Hindu Kush mountains into Afghanistan. The pilots of the Chinooks, flying in zero-visibility conditions, were refueled in flight three times during the 11-hour mission, establishing a new world record for combat rotorcraft. The troops — two 12-man Green Beret teams from the 5th Special Forces Group dubbed Operational Detachment Alpha (ODA) 555 and 595 plus four Air Force Combat Controllers — linked up with the CIA and Northern Alliance. Within a few weeks, the Northern Alliance, assisted by U.S. ground and air forces, captured several key cities from the Taliban. In November 2001, Night Stalker AH-6J Little Birds took part in Objective Wolverine and Raptor missions and Operation Relentless Strike. In December 2001, Night Stalker crews resupplied more than 150 Delta Force, British Special Boat Service, and CIA Special Activities Division operatives as they hunted for Osama bin Laden in the Tora Bora mountain complex. In January 2002, in Afghanistan, Task Force Sword was renamed Task Force 11 and was composed of a DEVGRU and a company of Rangers, and was supported by a company of helicopters from the 160th SOAR. On 21 February 2002, while scouting Islamist terrorists on Basilan Island as part of Operation Enduring Freedom – Philippines and seeking to rescue a nurse and an American missionary couple, a MH-47 crashed at sea in the southern Philippines' Bohol Strait, killing 10 servicemen (eight from E company, 160th SOAR and two from the 353rd Special Operations Group). In March 2002, Night Stalkers from B Company, 2nd Battalion, 160th SOAR supported coalition troops during Operation Anaconda, particularly at the Battle of Takur Ghar on March 4, where one of their MH-47Es, callsign Razor 03, was damaged by rocket-propelled grenades and crash-landed carrying Mako 30. A second MH-47E, callsign Razor 01, responded to the shootdown with a Quick Reaction Force; it was damaged by small arms and rocket-propelled grenades, and crash-landed. One Night Stalker was killed in the battle. On 21 June 2002 in the Philippines, Night Stalker MH-47Es were involved in the operation that killed Abu Sabaya, a senior leader in Abu Sayyef. A U.S. Predator drone marked the person with an infrared laser as he tried to escape in a smuggler's boat. The MH-47Es trained searchlights on the boat while operators from the Philippine Naval Special Operations Group opened fire, killing the terrorist leader and capturing four other terrorists with him. During the 2003 invasion of Iraq, 3rd Battalion, 160th SOAR, deployed as the Joint Special Operations Air Detachment-West under CJSOTF-West (Combined Joint Special Operations Task Force-West/Task Force Dagger). It was equipped with eight MH-47E Chinooks, four MH-60L DAPs, and two MH-60M Black Hawks. At 9 p.m. on 19 March 2003, the first strike of Operation Iraqi Freedom was carried out by members of the 160th SOAR, on Iraqi visual observation posts along the southern and western borders of Iraq. The strike groups included one flight of MH-60L DAPs and four "Black Swarm" flights, each consisting of a pair of AH-6M Little Birds; a FLIR-equipped, target-spotting MH-6M; and a pair of U.S. Air Force A-10As. In seven hours, more than 70 sites were destroyed, effectively depriving the Iraqi military of any early warning of the coming invasion. As the sites were eliminated the first heliborne SOF teams launched from H-5 airbase in Jordan, including vehicle-mounted patrols from the British and Australian special forces, who were transported by the MH-47Es of the 160th SOAR. Nightstalkers from 1st Battalion 160th SOAR were tasked with supporting Task Force 20 with its MH-60M Blackhawks, MH-60L DAPs, MH-6M transport and AH-6M Little Birds; they were based at Ar'Ar. On March 26, the 160th SOAR took part in the Objective Beaver mission, a raid by DEVGRU on a complex known as al Qadisiyah Research Centre that was suspected to have stocks of chemical and biological weapons. On April 1, 2003, the 160th SOAR took part in the rescue mission of PFC Jessica Lynch who was taken prisoner during the Battle of Nasiriyah. On April 2, a Delta Force squadron operating in Iraq was ambushed by a half-dozen armed technicals from an anti-special forces Fedayeen. Two MH-60K Black Hawks carrying a parajumper medical team and two MH-60L DAPs of the 160th SOAR responded and engaged the Iraqis, which allowed the Delta operators to move their two casualties to an emergency HLZ. However, one Delta Force operator succumbed to his wounds. On the evening of December 13, 2003, Saddam Hussein was captured by U.S. forces in Operation Red Dawn, he was exfiltrated by a MH-6 Little Bird from the 160th SOAR and he was taken into custody at Baghdad International Airport. In 2004 they took part in the rescue of three Italian contractors and one Polish businessman held for ransom by Iraqi insurgents. In Afghanistan in 2005: Eight Night Stalkers (four from HHC and four from Bravo company of 3rd Battalion) were killed along with eight Navy SEALs on a rescue mission for Marcus Luttrell, after their MH-47 Chinook helicopter was hit by an RPG (rocket propelled grenade). They were sent out to look for Luttrell after Operation Red Wings, in which he was involved with three other SEALs, was compromised and Luttrell's teammates killed. In March 2006, SEALs from DEVGRU and Rangers were flown by the 160th SOAR into in North Waziristan, Pakistan, to assault an al-Qaeda training camp. In this Operation Vigilant Harvest, the assaulters killed as many as 30 terrorists including the camps commandant. On 14 May 2006, helicopters from the 160th SOAR brought operators from Delta Force's B Squadron to Yusufiyah, Iraq, to fight al-Qaeda fighters in several buildings. As the operators disembarked their helicopters, they came under fire from a nearby house, and more al-Qaeda fighters soon joined the firefight. The door gunners of the 160th's Black Hawks fired at the insurgents; a pair of AH-6M Little Birds carried out strafing runs. One Little Bird from the 160th's 1st Battalion, B Company, was shot down. An estimated 25 al-Qaeda fighters were killed. In July 2006, a pair of MH-47Es from 160th SOAR attempted to insert a combined strike element of DEVGRU, Rangers, and Afghan commandos in Helmand Province, Afghanistan, to attack a compound. With some troops on the ground, a large insurgent force ambushed them. Both helicopters were struck by small arms fire. One MH-47E pilot put his aircraft in the line of fire to protect the other MH-47E as its assault team disembarked. An RPG hit the shielding MH-47E, whose pilot crash-landed with no serious injuries to operators or aircrew. The Ranger commander and an attached Australian Commando organized an all-round defence while the other MH-47E held back the advancing insurgents until its miniguns ran out of ammunition. An AC-130 Spectre joined the battle and kept the down crew and passengers safe until a British Immediate Response Team helicopter recovered them. The AC-130 then destroyed the MH-47E wreck, denying it to the Taliban. 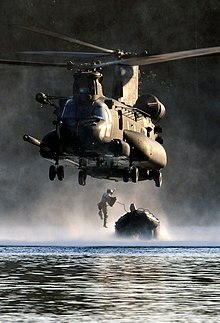 Elements of 3rd Battalion 160th SOAR have conducted episodic deployments in support of Operation Enduring Freedom – Caribbean and Central America, begun in 2008. Night Stalker helicopters were present during the 2008 SOCOM counter-terror exercises in Denver. On 24 April 2008, Company D, 3rd Battalion, 160th SOAR was inactivated at a ceremony conducted at Hunter Army Airfield, Georgia, as part of a regimental transformation plan. The 160th SOAR also took part in the 2008 Abu Kamal raid. On 19 August 2009, four Night Stalkers from D Company, 1st Battalion, 160th SOAR lost their lives in a MH-60 Black Hawk helicopter crash in Leadville, Colorado, during mountain and environmental training. On 9 September 2009 in Afghanistan, Nightstalkers inserted the British SBS and SFSG into Kunduz Province to rescue Times journalist Stephen Farrell after he and his Afghan interpreter were captured by the Taliban. On 19 September 2009 in Somalia, the Nightstalkers took part in Operation Celestial Balance, whose target was a senior terrorist leader connected to al-Qaeda affiliated organizations. The assault force (4 AH-6M Little Birds and 4 MH-60L Blackhawks) carried in DEVGRU operators to kill or capture the leader. AH-6Ms strafed the two-vehicle convoy, killing the leader along with three other al-Shabaab terrorists, then carried out an overwatch while DEVGRU cleared the vehicles and recovered the body. On 22 October 2009, a 3rd Battalion helicopter crashed into the USNS Arctic during a joint training exercise involving fast roping about 20 miles off Fort Story, Virginia. The crash killed a soldier, Sergeant First Class James R. Stright, 29, and injured eight others, three seriously. In May 2011, the Night Stalkers provided insertion and cover for the raid on Osama bin Laden's compound. On 28 May 2012, Operation Jubilee took place: Blackhawks from the 160th SOAR flew in a teams from the British 22nd SAS Regiment and DEVGRU into Badakhshan Province, Afghanistan so they could rescue a British aid worker, a Kenyan NGO worker and 2 Afghans who were taken hostage by Bandits in the province. The rescue was a success. On 15 January 2014, a MH-60M Black Hawk of the 160th performed a hard landing at Hunter Army Airfield in Georgia. One soldier, CPT Clayton Carpenter of NY (posthumously promoted to MAJ), was killed with another two injured. On 4 July 2014, during Operation Inherent Resolve, the Night Stalkers inserted Delta Force operators into Syria to rescue James Foley and other US hostages. One American was wounded, no hostages were found, but a substantial number of terrorists were killed. CENTCOM mistakenly posted a video on the internet of a flight of four MH-60Ms of the 160th SOAR conducting a mid-air refueling over Iraq in October 2014, the video was hastily taken down. On November 26, 2014, MH-60s flown by Nightstalkers took part in the first raid in the 2014 hostage rescue operations in Yemen. The Night Stalkers continue to be deployed to Afghanistan as part of NATOs Resolute Support Mission after Operation Enduring Freedom-Afghanistan ended in late 2014 and was replaced with Operation Freedom's Sentinel. Throughout that night of 5 December 2015, a group of Rangers engaged in a firefight with enemy troops near the Afghan-Pakistan border; after about 5 a.m. their commander called for an extraction after they learned of a larger enemy group approaching. A helicopter from the 160th SOAR arrived and began receiving heavy fire from the enemy, an AH-64 Apache helicopter from the 1st Battalion 101st Aviation Regiment escorting the helicopter, put their Apache directly between the U.S. troops, the helicopter and the enemy forces to draw the fire. As a result, the extraction was a success. The Washington Post reported that 160th SOAR took part in the Yakla raid in Yemen on 29 January 2017, distinguishing itself when its helicopters flew repeatedly into heavy enemy fire to support U.S. Navy SEALs pinned down on the ground. On 25 August 2017, a Black Hawk helicopter flown by the 160th SOAR crashed off the coast of Yemen while conducting hoist training when it lost power and crashed into the sea, six servicemen survived, one US service member remained missing. CNN reported that on 27 October 2017, a US helicopter from 4th Battalion 160th SOAR crashed in Logar province, Afghanistan, killing one and injuring 6 more US servicemembers, the crash was not a result of enemy action. The 160th features prominently in the 2001 film Black Hawk Down. In the book Lone Survivor the pilots from the mission were 160th SOAR "Night Stalkers". The 160th figures prominently in M. L. Buchman's Night Stalkers novel series and related short stories with minor roles in the Firehawks series. In Jason Morgan's 2017 memoir A Dog Called Hope, The author recounts his time with the 160th and his life after being injured during an operation in Central America. ^ "US Military to open 6200 new jobs to women". ^ a b Laudano, Kimberly (28 September 2006). "Green Platoon — first step to SOAR". Fort Campbell Courier. Retrieved 6 August 2017. ^ "160th SOAR(A) Green Platoon Train-up program". 160th Special Operations Aviation Regiment. United States Army. Archived from the original on 31 May 2008. Retrieved 21 November 2008. ^ Gresham, John (12 September 2011). "The Campaign Plan – Special Operations Forces and Operation Enduring Freedom". Retrieved 11 September 2015. ^ Fury, Dalton. Kill Bin Laden. St Martin's, 2008. Print. ^ "'No survivors' in U.S. chopper crash". CNN. 24 February 2002. Retrieved 24 December 2016. ^ "Operation Enduring Freedom casualties". iCasualties. 24 December 2016. Archived from the original on 3 December 2011. Retrieved 24 December 2016. ^ "Sgt Thomas Ferrell Allison (1979 - 2002) - Find A Grave Memorial". findagrave.com. ^ "HONORING THE U.S. ARMY HEROES OF OPERATION RED WINGS". soldiers.dodlive.mil. ^ "Operation Enduring Freedom - Caribbean, Central America (OEF-CCA)". GlobalSecurtiy.org. ^ "160th Special Operations Aviation Regiment (SOAR)". shadowspear.com. 15 January 2009. Retrieved 18 January 2017. ^ "Special ops aviation company deactivated". Army Times. Army Times Publishing Company. 4 May 2008. Retrieved 21 November 2008. ^ "PRESS RELEASE: Four Special Operations Aviation Soldiers die in helicopter crash in Colorado". USASOC News Service. Archived from the original on 3 September 2009. Retrieved 22 August 2009. ^ King, Lauren, "One Killed, Several Injured In Copter Crash On Navy Ship", Norfolk Virginian-Pilot, 23 October 2009. ^ Clayton, Cindy, and Lauren King, "Army, Navy Investigating Deadly Copter Crash On Ship", Norfolk Virginian-Pilot, 24 October 2009. ^ Burns, Robert (6 May 2011). "Stealth chopper secrets may have been exposed". Toronto Star. Associated Press. ^ Unknown. "Major Clayton O Carpenter" (PDF). J. A. UNDERWOOD. ^ "PRESS RELEASE: Special Operations Aviation Soldier dies in helicopter training accident". U.S. Army. 4 March 2014. ^ "One killed in US 'Night Stalkers' hard landing". BBC News. ^ "2 Fort Campbell soldiers receive Distinguished Flying Cross". army times. 2 June 2016. ^ "Black Hawk helicopter that crashed off Yemen belonged to elite Special Operations air unit". Washington Post. 26 August 2017. ^ "Pentagon identifies US service member killed in Afghanistan copter crash". CNN. 29 October 2017. ^ Maj. MIKE BURNS, For The Eagle Post (1 August 2012). "Evans assumes command of 160th SOAR – The Eagle Post : News". Theeaglepost.us. Retrieved 10 July 2013. ^ M. L. Buchman. "M. L. BUCHMAN". M. L. BUCHMAN. 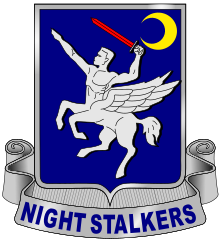 This article incorporates public domain material from the United States Army Center of Military History document "160th Aviation Regiment (Night Stalkers) Lineage and Honors". Wikimedia Commons has media related to 160th Special Operations Aviation Regiment (United States).